Poor Jackie Kelly. She was only trying to do ride the wave of Islamophobia others had made respectable, from Little Johnie War Criminal himself to Rupert the War-Tout. It seems unfair when petty copycats get caught out like this. If I was the Judge, I'd require Ms Kelly to wear purdah while working as a barmaid in local pubs. Her bodgy partner, Mr Clark, should clean urinals at footy matches dressed as a Mullah. McKenzie roared away with slavering relish during the media's Islamophobic fever, "THEY just don't mix in....blah blah blah." 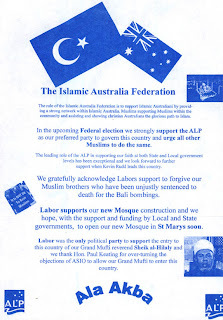 If the ignoramus had bothered to get off his spreading bum, he would find a Sunni Mosque in Mareeba, the Arabic lettering on the front dedicating the mosque to Allah. Mareeba has had a Sunni population for decades (and no, not all "Albanians"! There are people of Pashtun and Arabic descent there.) Members of the Muslim population have inter-married into both the white and black communities. Some of the women wear hijab, salwar kameezes etc, most dress in Western clothes and a lot of the blokes will have the odd coldie.